Lets you search for all meeting rooms, desks, and bookable resources across multiple locations with ease, right inside the already familiar interface of Outlook and Office 365. Set room criterias, like whiteboard, airtame etc. Search for all meeting rooms or hot desks across multiple locations and time zones. Instantly know the availability of the room before you try booking it. See who has booked the room if it’s occupied, and when the room will be released. Users can search and sort by the purpose of a meeting (e.g. video conference), special features (room with a whiteboard or projector), and guaranteed attendee capacity. Finding the right room has never been easier. Book your meeting room in AskCody Workplace and enable audio or visual functionality with Skype for Business. When "Video Conferencing" or similar is chosen, simply press the "Add Skype Meeting" and a Skype for Business link is added to invite, while automatically activating Skype Room System equipment inside the meeting room to quickly join the meeting. It’s simple to join from a meeting room with a Skype Room System, from a laptop or a mobile device; the meeting invitation will allow you to click to join from wherever you want. AskCody is 100% integrated with Outlook and Office 365. No need for outdated third-party tools, unintegrated Sharepoint sites, 3rd party webpages, or paper-based bookings. RoomFinder comes as a Modern Add-in for Outlook and Office 365 and runs where Outlook is. With Insights you will see your office and meeting rooms in full context with all available data about utilization. You can easily experience how your office space and meeting rooms are actually being used and make the most out of your workspace. 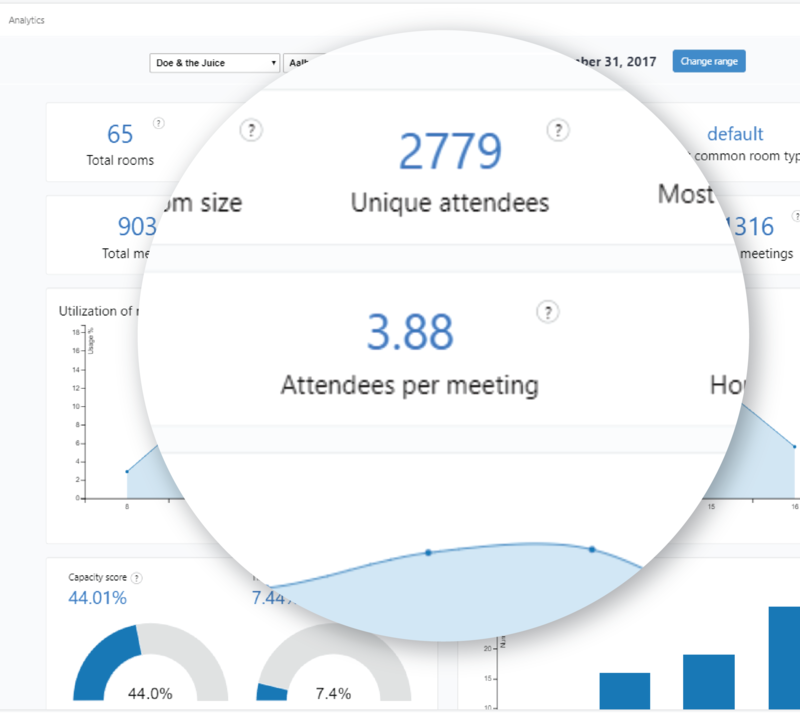 With Workplace and Insights, you can go deeper into conference room activity, with daily reporting for key metrics like meetings and occupancy, no-shows and ghost meetings, duration and attendees and get the insights and trends displayed in a beautiful dashboard. How can users search for resources? Learn more about adding equipment and services to Workplace in our support center. Can I control who is able to book rooms? Yes, you can support a decentralized room booking process with AskCody. Some users can request rooms with others empowered to approve their requests. Learn more in this support article, user roles and membership hierarchy. Can I search just in my country or floor? Yes, AskCody supports custom groups, including grouping rooms by floor, amenity, preference, or internal business logic. Are external users able to book rooms? Yes, if you choose to allow it. AskCody supports two different methods of enabling external booking. What about hot desking and office hoteling? AskCody offers full support for finding and booking hot desks or office hotels. Both are loaded into our system as resources. Then you can decide if you wish to allow external users to book these resources. Integrations with the AskCody Wayfinder allow a map to the office to be attached, or for the map to update showing when a desk or office hotel is booked. Can you book resources on behalf of someone else? Yes, with delegate access or shared access to calendars. Delegate gives access to the entire account, including calendars and email. Shared gives access to calendars (i.e. can't send emails on behalf of other people). 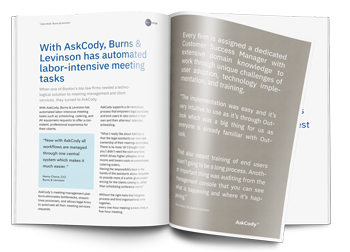 “We chose AskCody's Meeting Management and Resource Scheduling platform, and today we have a solution that very well meets our needs and makes everyday life more efficient for our employees and visitors."